What’s the biggest advice that the big players can give to SMEs? Think big and dream big – even in the face of huge adversities from all fronts, either from the government or from competitors. As Xurpas, Inc. chairman and president Nix Nolledo pointed out, even as he saw himself as the newcomer among fellow executives on stage at the Philippines Investment Conference 2016 held last Tuesday at the New World Hotel, Makati City, budding entrepreneurs must rise to the demands of the market. “You must try to dream very big,” shared Nolledo, when asked what he wished to share with the start-up businessmen in the room, citing that most of the country’s small and medium businesses at present are primarily self-driven and not market-driven. Moderated by Eduardo Francisco, president of BDO Capital and Investment Corporation, the panel called “Views from the Board Room” saw the participation of economists, business leaders from around the country and the world, investment consultants and policy-makers from the government. “Views from the Board Room” was part of the program organized by CFA Society and CFA Institute, an association affiliated with a global network of finance and investment professionals. This year, the Philippines Investment Conference focused on the country’s sustaining development efforts in a backdrop of global policy divergence. “Everyone in the industry all look forward to policies that will continue to ensure sustainable growth rates and to reinforce investor confidence in the country,” said Cristina P. Arceo, president of CFA Society Philippines and vice-president and head of the Fixed Income Desk at China Banking Corp, in a statement. During the discussions, Jeffrey Lim, president of SM Prime Holdings, Inc., echoed this welcome for the unprecedented growth of the market, but added that it must be ushered in with forethought and careful control. “The growth that we generate must be sustainable,” said Lim, as he cited a number of examples and challenges faced by his property development company, including but not limited to securing requirements and permits, and the conversion of real estate between residential and commercial use. The government announced the seven percent growth of the Philippine economy for the second quarter last August, a record level in three years. Incidentally, this was followed by a series of lows for the Philippine peso, and an array of investment pull-outs from local industries, sending the PSEi through a rocky path for the past weeks. Speaking in behalf of the banking industry, Valentin Araneta, monetary board member of the Bangko Sentral ng Pilipinas, assured the investment sector of the apparent strength of the Philippine market as external sector dynamics, such as OFW remittances, external debt and BPO services, continue to be favourable. “We can weather volatilities from external sources for we have a robust and well-capitalized banking system,” said Araneta, right after introducing the Duterte administration’s target deficit of three percent for 2017. Speaking from experience, Jose Ma. 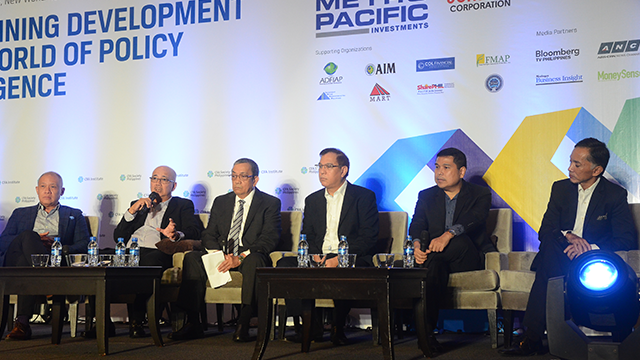 Lim, president and chief executive officer of Metro Pacific Investments Corporation, lauded the government’s efforts to increase spending on infrastructure as well as lessen taxes. “This government is open to unsolicited proposals,” he shared with his fellow leaders onstage when asked of his opinion on the new administration’s business policies. Through the years, Metro Pacific Investments Corporation has engaged in various infrastructure projects with the government, and has recently secured the NLEX-SLEX Connector Road deal which will directly link the North Luzon provinces with Southern Luzon and vice-versa, right through the heart of the National Capital Region. Ernest Cu, chief executive officer of Globe Telecom, meanwhile called for the “elimination of bureaucracy” in the government’s various approving and granting agencies and departments. Citing an example, he recalled being “slapped with numerous taxes” before being able to build a cell site in one of the country’s remote areas. Such challenges, he said, makes it difficult for the telecommunications sector to move forward and rise to the standards set by our neighboring countries. On the other hand, the energy sector faces a different set of roadblocks, as revealed by Nestor Vasay, chief financial officer of Energy Development Corporation, the largest producer of geothermal energy in the Philippines. When asked what keeps him and his board room awake at night, he went on to share his experiences with climate change, as well as the advent of new technology and its potential disruption of human labor services. Together, these executives called for a renewed interest in investments, but not without tips for the beginning investor – “truly understand the company you’re investing in”, to “be objective”, and to “get into the mindset of the CEOs”. Jerricho Reynaldo is an editor, writer, and creative and social media consultant. He has written for various local and international publications that include North Bound Magazine, asianTraveler Magazine and Planet Philippines. His writings and editorial work cover a wide range of topics, from food and travel, to business-lifestyle and entertainment. Read more of his works at Brewing Echo.